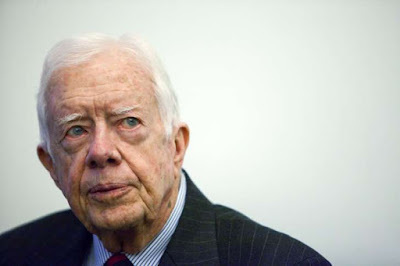 Carter was way ahead of his time when he declared then that “The U.S has no functioning Democracy” which did not appear in the American mainstream press; Carter also rightfully defended NSA whistleblower Edward Snowden actions declaring that “the invasion of human rights and American privacy has gone too far” and finally Carter correctly argued that “Israel’s continued control and colonization of Palestine land have been the primary obstacles to a comprehensive peace agreement in the Middle East.”~ and yet Jimmy Carter continued to be ostracized by the global elite and main stream press who obviously deeply feared his revolutionary moral truths ~ and now Jimmy is preparing to depart with a spreading and perhaps incurable cancer, but he most certainly will not depart quietly into the night. Here are excerpts of Carter's exact words on the moral apathy which has gripped our nation as well as our lack of a spiritual base ~ "Our people are losing that faith, not only in government itself but in the ability as citizens to serve as the ultimate rulers and shapers of our democracy. As a people we know our past and we are proud of it. Our progress has been part of the living history of America, even the world. We always believed that we were part of a great movement of humanity itself called democracy, involved in the search for freedom, and that belief has always strengthened us in our purpose. But just as we are losing our confidence in the future, we are also beginning to close the door on our past….But we've discovered that owning things and consuming things does not satisfy our longing for meaning. We've learned that piling up material goods cannot fill the emptiness of lives which have no confidence or purpose…. The symptoms of this crisis of the American spirit are all around us. For the first time in the history of our country a majority of our people believe that the next 5 years will be worse than the past 5 years. Two-thirds of our people do not even vote. The productivity of American workers is actually dropping, and the willingness of Americans to save for the future has fallen below that of all other people in the Western world." Jimmy Carter is a global moral force and trouble shooter for fairness and justice who gives living truth to these words by William James ~ words which also happen to be an inspiration for myself ~ "I am done with great things and big things and great institutions and big successes, and I am for those tiny invisible molecular forces that work from individual to individual, creeping through the crannies of the world like so many rootlets or like the capillary oozing water, yet which, if you give them time, will bend the hardest monuments of human pride"
And now Jimmy Carter at 90 may be dying of Cancer but he is fully prepared for the worst. "I'm ready for anything and looking forward to a new adventure," said Carter, appearing upbeat and making jokes as he openly talked about his cancer during a recent news conference.
. "I just thought I had a few weeks left, but I was surprisingly at ease. I've had a wonderful life," the 90-year-old Carter said. "It's in God's hands. I'll be prepared for anything that comes." Most people are not only afraid of death but they are really afraid of the incompleteness of their lives ~ but that most certainly does not include Jimmy Carter who is seemingly ready for his next exciting adventure of transitioning into another state of consciousness ~ the Unified Field of love and soul consciousness that lies not only beyond the event horizon of death but also beneath our deepest fears, as I demonstrate every day in my heart centered self-healing consultations. Since death is an illusion measured by the limits of our consciousness ~ Jimmy Carter's greatest gift may well be demonstrating to us how his strong faith can both face and defeat Death. There have been many tributes to Carter but one interview in the Los Angeles Times, was especially well done. Written by the New York Times‘ Carolyn Kellogg, it was on target, with this headline: “In ‘A Full Life,’ Jimmy Carter at 90 remains a wise truth teller”. Kellogg wrote that Carter’s book demonstrates his consistent “truth telling”. It is entitled, A Full Life: Reflections at Ninety. However, it was Carter’s truth-telling in his book Palestine: Peace Not Apartheid, which forced the Israel-Palestine issue into the light of the world’s attention and in many ways inspired the world wide BDS movement against Israel. Without that book, which cost him dearly in American circles of power in the nation he led for four years, the truth of Palestinian occupation might still be struggling to gain a hearing in the court of world opinion. 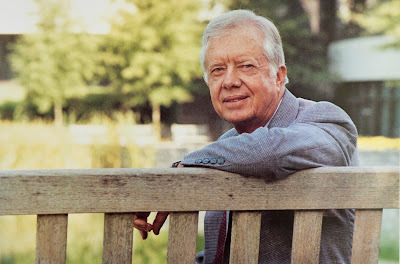 Truth tellers are rarely appreciated and usually have only one option, tell their truth ~ but it is also the only way you can truly love yourself ~ which explains Jimmy Carter's inner peace of mind as he prepares to depart this life. Hamilton Jordan worked for Carter and offers this telling insight ~ "It's hard to look inside a person to answer a question about why anybody wants to be president. I suppose a combination of ambition, ego, and a real feeling that he could make a difference and could accomplish some things. All you ever had to do for Jimmy Carter was to tell him something was impossible, and he would usually do it." But Ambassador Andrew Young, who prays with Carter, wrote this telling assessment of his friend ~ "President Jimmy Carter was a citizen soldier. Ironically, he was considered weak because he didn't kill anybody and he didn't get anyone killed." Out of such supposed weakness grow giants of moral integrity such as Jimmy Carter.